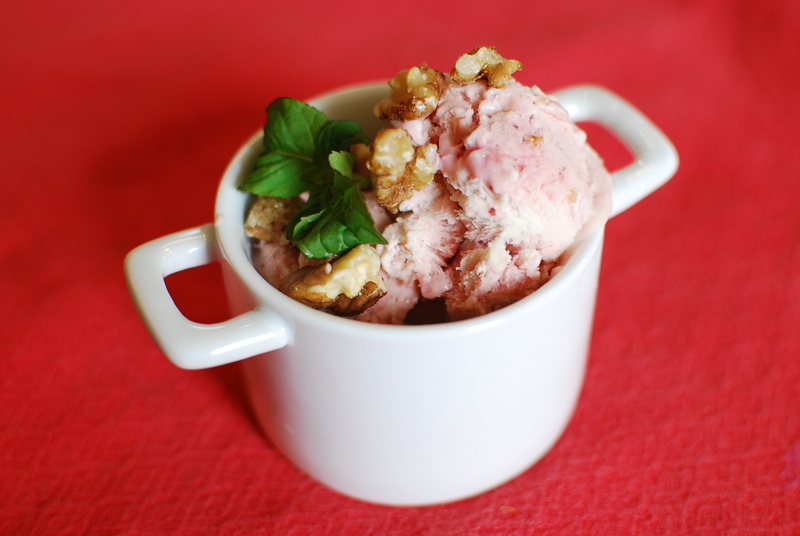 The thought of making ice cream has always evoked for me the smells and sounds of my grandparents’ cellar in Marseilles, Illinois. Even when I use my Cuisinart doohickey with the canister you keep in the freezer so it’s ready when you’re ready, my brain conjures up sharp, minerally rock salt and wet burlap sack, scents co-mingled by the iron crush of a hammer wielded, alternately, by my brother, Mike, and my uncle, Mike. I hear the twin creaks – that giant, sloping , oak storm door and the handcrank we (Dad, Grampa, the Mikes, and scrawny-armed me) all took turns chug-chugging for what seemed like hours. Now I wonder, after my first experiments with the no-churn method, will making ice cream evoke only Nigellissima’s voice and the pop-top thwack of a can of sweetened, condensed milk? I first heard Nigella Lawson rave about no-churn on Morning Edition a few months ago, and I’d been wanting to try it ever since. So, rather than jar another pint of jam with this week’s remnant rhubarb, strawberries, and cherries, I thought I’d give a red-medley version a whirl. I split the batch in two, so that a misstep wouldn’t waste all the fruit. 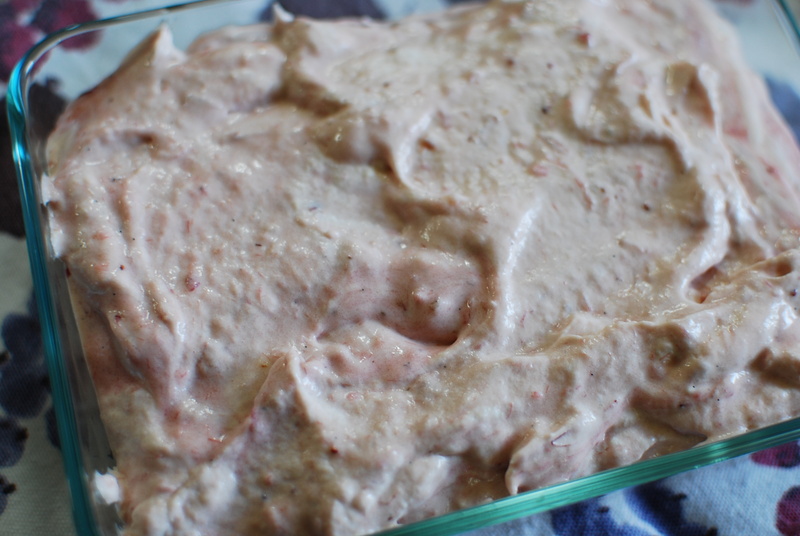 Turned out to be a wise move, since the first attempt – in which I assumed I’d still have to sugar the rhubarb pretty heavily – resulted in something way too sweet for my taste. The full-batch recipe you see below significantly scales back on the added sweetener and lets the zing of the rhubarb shine through. To be sure, the texture can’t approach a true custard that’s been painstakingly kept in motion while it freezes, but it tastes pretty damned good, and it really couldn’t be easier. 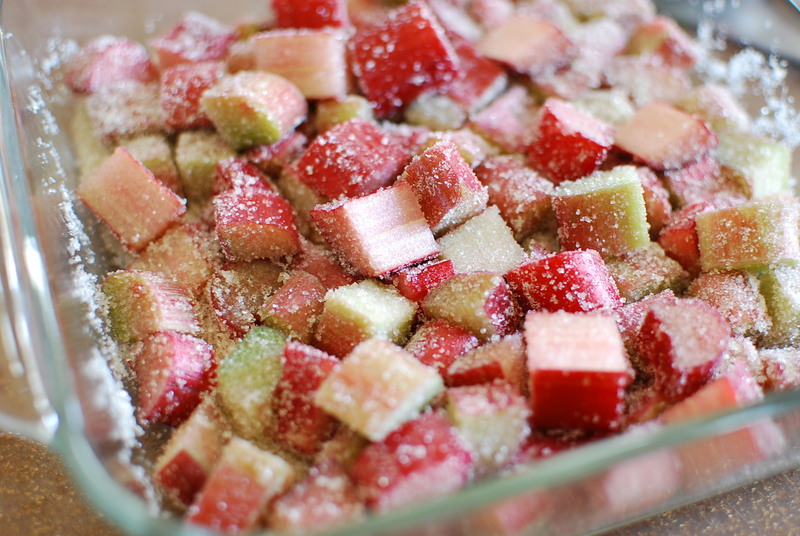 Place rhubarb in an ungreased roasting pan, toss with sugar, vanilla seeds and pods. Roast in a 375° oven for about 25 minutes, or until tender. Let cool. Add the condensed milk to the fruit mixture and combine completely. Set aside in a large bowl. Meanwhile, whip the heavy cream until stiff peaks form (shouldn’t be more than 3 minutes with a mixer or 6-7 minutes by hand). 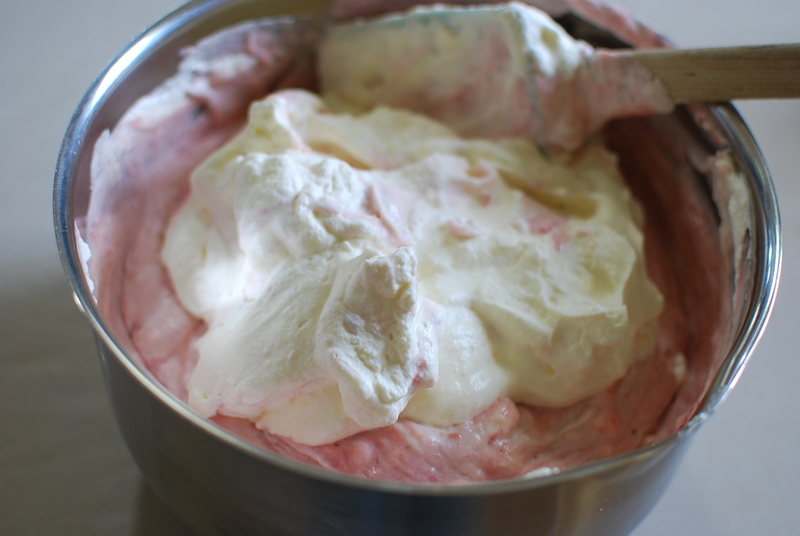 Gently fold the whipped cream into the fruit-milk mixture, about one-third at a time, taking care to incorporate it fully before you move on. Pour the mixture into loaf pans or other shallow containers. Freeze for at least 6 hours. Because if you taste it after just 4 hours, while it’s still soft, you won’t have any left for the weekend party you made it for in the first place. I did that once and frankly, I’d forgotten all about it. It works for me though as I forget to “freeze” the canister in advance. How was the flavor? Flavor was terrific, Tammy, but I had great fruit to start with. For me, nothing can compare to real custard-based ice cream, but that minor loss of texture for not having to bust out the double-boiler is a pretty easy trade-off to make. For my subsequent batches, I did find cans of organic s-c milk at my local Whole Foods, and I do think that resulted in a better tasting and feeling end product.